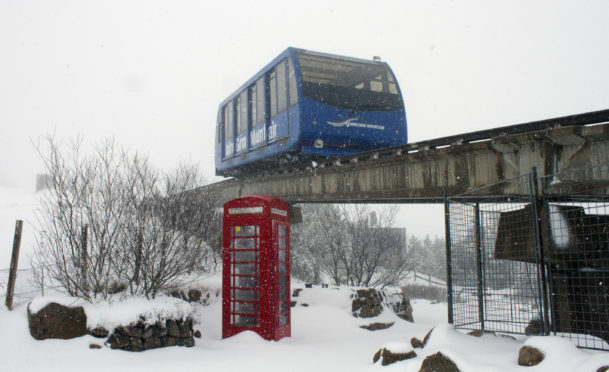 The funicular railway at CairnGorm Mountain in snowy conditions. A report into the safety of the Cairngorm funicular railway has been further delayed – and will not be published until after the New Year. The mountain railway was taken out of action in September amid fears about the supporting structure, sparking concern for the fortunes of the ski centre over the coming winter months. Specialist engineers were brought in to assess the situation, but have been hampered by poor weather – leaving business leaders and politicians frustrated as to when a final report will be out and when the railway will finally be repaired. However, there was some good news yesterday for skiers, with ticket prices being reduced by a quarter and news the snow factory is working well – allowing skiing to begin “in a matter of days”. Highlands and Islands Labour MSP Rhoda Grant said: “It’s disappointing that this report has been delayed again as the fate of the funicular is crucial to the health of the local economy. Mike Dearman, director of Aviemore and Glenmore Community Trust, said: “It’s disappointing that we won’t know the fate of the funicular for a while longer, but we appreciate that conditions on the mountain are very difficult and the delay can’t be helped. “It has long been our view that given the complexity of the investigation alone, the funicular was unlikely to run this season, so this does not materially change our outlook. A report was first expected by mid-November, with hopes remedial repairs could be carried out to ensure it could operate over the winter season. However, this was put back to December 3 after the complexity of the investigations was realised, and was further delayed because of the weather, with high winds causing health and safety issues high on the mountain. Some of the monitoring cameras have also been icing up. Revised ticket prices mean a normal one-day ticket reduced from £107.35 for a family of four to £80.50. Adults are reduced from £37 to £27.75, juniors £22.65 to £17, seniors £27.30 to £20.45 and students £29.35 to £22. Afternoon tickets are cheaper, including £64.40 for a family of four.